This twist on a traditional lemon meringue pie contains a stewed fig filling thickened with sugar and eggs and a light and fluffy meringue made from egg whites and sugar. This recipe uses a ready-baked pastry case, although you could make your own. Quarter the figs and place into a bowl with enough water to cover them. Cover the bowl and leave to soak for 12 hours. After soaking, pour the figs and soaking water into a saucepan. Simmer on a very low heat for 2 and a half hours, adding more water if needed. Beat together the two whole eggs with two tbsp. of caster sugar and salt. 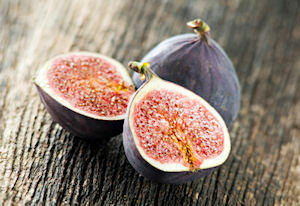 Pour into the stewed figs, whisking vigorously, stirring over a low heat until the mixture thickens. Pour into the prepared pastry case. Beat together the egg whites in a clean mixing bowl until foamy. Continue beating whilst adding the remaining sugar one tbsp. at a time. Whisk until you have a stiff meringue mixture. Spoon on top of the fig filling and place in a 200C oven for 12 minutes, until the meringue is browned. A tasty addition to this pie would be a layer of flaked almonds in between the figs and the meringue. Flavour the figs with lemon juice for a little extra taste. This recipe serves eight people.